Vi Medical Products offers a cutting edge line of products that reverses and prevents skin aging, for beautiful skin that lasts a lifetime. Skin that is properly maintained with regular peels and home care stays healthy, youthful and radiant at any age. For anti-aging Vi Peel reverses the effects of sun damage, environmental factors and time, to enhance your skin's natural beauty. In addition to facial treatments, the Vi Peel can also be used to treat sun damage on the décolletage and hands. Highly effective in clearing acne and impurities for patients as young as twelve years old; a series of treatments may reduce acne scars. The Peel is virtually painless. Sensitive individuals may experience a slight stinging sensation, which is controlled by use of a fan during application. Your treatment takes only 20 minutes or less. No skin preparation products are needed. Enjoy younger looking, more beautiful skin in about one week! What Does The Peel Do? 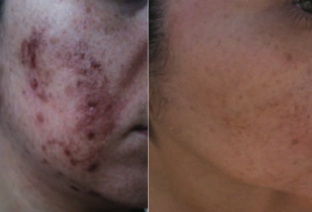 Anyone who wants younger looking, healthier skin will benefit from the Vi Peel. "I had to share my story because I know I am not alone in the struggle with Melasma. I have since had a total of 4 Vi Peels and the difference in my skin is nothing short of a miracle. I feel like I have my life back. I am traveling again, which is what I missed most."